Harold Eugene Orr was president of the Superior Manufacturing Company of Armarillo, Texas. Orr became a business associate of Billie Sol Estes. Estes's business encountered problems when the Department of Agriculture began to control the production of cotton. Allotments were issued telling the cotton farmers how much they could and could not plant. In 1958 Estes made contact with Lyndon B. Johnson. Over the next couple of years Estes ran a vast scam getting federal agricultural subsidies. According to Estes he obtained $21 million a year for "growing" and "storing" non-existent crops of cotton. Orr also became involved in these finance frauds. Marshall was disturbed that as a result of sending a report of his meeting to Washington, he was offered a new post at headquarters. He assumed that Bille Sol Estes had friends in high places and that they wanted him removed from the field office in Robertson County. Marshall refused what he considered to be a bribe. On 3rd June, 1961, Henry Marshall was found dead on his farm by the side of his Chevy Fleetside pickup truck. His rifle lay beside him. He had been shot five times with his own rifle. County Sheriff Howard Stegall decreed that Marshall had committed suicide. No pictures were taken of the crime scene, no blood samples were taken of the stains on the truck (the truck was washed and waxed the following day), and no check for fingerprints were made on the rifle or pickup. Harold Orr was also arrested and was eventually given a ten-year prison sentence. He was allowed to go home and rumours began to circulate that Orr was planning to provide information on the case to the authorities. On 28th February, 1964, Harold Orr was found dead in his garage. The Justice of the Peace pronounced it accidental death by carbon monoxide poisoning. J. Evetts Haley published A Texan Looks at Lyndon in 1964. In the book, Haley suggested that Lyndon B. Johnson had employed Mac Wallace to murder Orr, John Kinser and Henry Marshall. 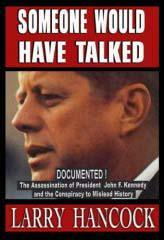 In 2003 Barr McClellan published Blood, Money & Power: How LBJ Killed JFK. In the book McClellan argues that Lyndon B. Johnson and Edward Clark were involved in the planning and cover-up of the murder of Haold Orr. On the night of April 4, 1962, at the western end of Texas, a ranchman came upon the body of George Krutilek in the sandhills near the town of Clint, slumped in his car with a hose from his exhaust stuck in the window. He had been dead for several days and the El Paso County pathologist, Dr. Frederick Bornstein, held that he certainly did not die from carbon monoxide poisoning. Krutilek was a forty-nine year old certified public accountant who had undergone secret grilling by FBI agents on April 2, the day after Billie Sol Estes' arrest. The investigation concerned the Estes affair. Krutilek had worked for Estes and had been the recipient of his favors, but he was never seen or heard of again after the FBI grilling until his badly decomposed body was found. Thus the mystery mounts. What did the accountant Krutilek know about Billie Sol's business that warranted murder? The enforced inhalation of this painless killer, carbon monoxide, leaving its own traces in lungs and blood and hence almost certain immunity for the murderer, is a subtle approach that would have charmed such early imaginative practitioners of assassination as the ancient Medici. Again in a case connected with Estes, this gas was held to be the legally blameless killer of Harold Eugene Orr, the late president of the Superior Manufacturing Company of Amarillo. Orr and the Company had played a key role in Estes' finance frauds, and Orr was arrested with Estes and given a ten-year federal prison sentence. Many of Estes' storage facilities had been built through contract with Coleman Wade, of Altus, Oklahoma, who was drawn into the sweeping investigations. Shortly after taking off in his plane from Pecos, on a return trip home early in 1963, he mysteriously crashed in the Kermit area. Government investigators swept in and instead of expeditiously cleaning up the wreckage in their routine way, kept the area roped off for days. Wade was well known to Lewsader, the Estes pilot, and this incident came near scaring him. Immediately after Estes was charged with fraud, the efforts at containment became more extreme. George Krutilek was chief accountant for Estes and his many schemes. Krutilek had been questioned by the FBI on April 2, 1962, in El Paso. Two days later, his body was found in the dry sand hills near Clint, Texas, a hose attached to the exhaust pipe of his pickup. An El Paso pathologist said carbon monoxide was not the cause of death, and he called attention to a severe bruise on Krutilek's head. He was ignored. The coroner's ruling was suicide. The next day, a federal grand jury indicted Estes and three others on fifty seven counts of fraud. Not surprisingly, Clark's criminal attorney, John Cofer, was named attorney for Estes. Two other men involved with Estes turned up as suicides. Harold Orr committed suicide in Amarillo, Texas, and Coleman Wade died in Chicago. Much later, Estes testified that the killings were by Wallace to protect Johnson. The Estes scandal continued in Washington. William E. Morris, an employee at the USDA, was fired for accepting gifts from Estes. Orville Freeman, USDA secretary, reported there were no special favors to Estes but that the FBI was investigating. Two days later, fines totaling more than one half million dollars were levied against Estes. Labor secretary Arthur Goldberg looked into the Estes dinner for Johnson, to see if there were any favors. One month later Assistant Secretary of Labor Jerry Holleman resigned for accepting a loan from Estes. The most ominous turn of events happened in Texas. On May 21, 1962, Bryan Russ, the Robertson County attorney, ordered a grand jury inquiry into Henry Marshall's death. In sessions extending over the next six weeks, the mysterious circumstances surrounding Marshall's death were examined again. Texas attorney general Will Wilson, preparing evidence for the grand jury, complained that he had been unable to get any information from the USDA. The agency had prepared a 180-page report into the scandal but declined to make it available. Under the leadership of Texas Ranger Clint Peoples, the Texas Department of Public Safety was investigating. They developed a composite of the man asking directions to Marshall's ranch.' Searching the scene of Marshall's death, Peoples found a plastic wrapper in the brush and believed that it could have been used to guide fumes from the exhaust to Marshall's body. The.22 caliber rifle had been recovered on the day of the murder a year before; however, Peoples was developing another connection, back to Wallace and the Kinser murder, back to the weapons Wallace had available to him back in 1951. In June 1962 Peoples reported to the grand jury that Marshall was murdered and that he was still investigating. The Houston medical examiner was called in to help, and he reported that Marshall was probably murdered, although it was a "possible" suicide. He explained that at least three of the five shots were debilitating. In other words, any one of the three more serious shots could have killed Marshall. No matter how the shots are counted, five rifle shots were impossible. The family also showed how Marshall could not have fired the bolt action rifle into his side. The reach was too far and weakness in his right arm made it very unlikely. On May 24, the FBI finally announced it would let the grand jury see parts of the USDAs internal report on Estes. In fact, less than 15 percent was disclosed. Robert Kennedy was keeping up the pressure while protecting his evidence and his brother. The very next day Johnson flew into Austin and drove to San Marcos to receive an honorary degree from his old college. At the ceremony, Johnson kept his mouth shut. Even though he was the honoree, he did not give a speech. Just like he clammed up during the 1948 election fraud, he was silent; the less said, the better. After the ceremony in San Marcos, Johnson continued to avoid the press. He returned to Austin where he met with Clark and Estes. At that same time, Estes was also in town to confer with the Texas attorney general. Since Will Wilson had political ambitions that year, he would not cooperate with Estes. The grand jury was carefully controlled. Despite the testimony from Peoples and the Houston medical examiner, by the end of summer the final decision was still suicide. According to some members of the grand jury, the prior ruling by the coroner had to be shown to be wrong and, in their opinion, that was not done. The prior ruling by justice of the Peace Lee Farmer was never explained. When asked, he simply mumbled, "I just don't have nothing to say now:" In other words he did not defend his suicide ruling. Still, the grand jury stayed with the suicide ruling. Later, a key member of the investigation was elevated to postmistress by Johnson.9 In those days, a good s the main reward for political favors. Finally, as we have noted, over two decades later, Estes's testimony and the evidence Peoples had was presented to still another Robertson County grand jury. They would have indicted Johnson. Texas Ranger Peoples would also testify in proceedings a year later to change the Henry Marshall death certificate from suicide to murder. The Estes case can only be explained by the terms of the deal he reached with Johnson. There is nothing in writing but the results show the oral arrangement. Estes was provided an attorney and a solid defense. His expectation was that he would be acquitted. Clark and Cofer, however, could not let him off because, just as with Wallace in the Kinser murder, he would be free to talk and he knew too much. If he were convicted, he would learn to keep his mouth shut and do his time. In addition, as a convict, his word would always be doubted. Estes would be able to keep his family together, living in relative comfort. Following any prison term, he could return to his former life and his family. Estes would keep his end of the bargain. Franklin, Texas: Convicted swindler Billie Sol Estes told a grand jury that illegal cotton allotments and other business deals he arranged with Lyndon B. Johnson's help in the early 1960's generated $21 million a year, with part of the money going to a slush fund controlled by LBJ, sources close to the grand jury said Friday. The sources said Estes testified that he and Carter met at Estes' home in Pecos after Marshall's death and that Carter commented that Wallace "sure did botch it up." The sources said Estes testified that Wallace planned to kill Marshall and make it look as if the death were suicide by carbon monoxide poisoning. According to the sources, Estes testified that Wallace hit Marshall on the head and then placed a plastic bag over Marshall's head and the exhaust pipe of Marshall's pickup truck. About that time, the sources quoted Estes as saying, Wallace heard a noise that sounded like an approaching car. Fearing that he was about to be discovered, Wallace shot Marshall in the abdomen five times with the .22-caliber rifle and left the scene, the sources quoted Estes as testifying. In the next two years, three other men with ties to Estes - George Krutilek, a Clint, Texas accountant; Amarillo businessman Harold Eugene Orr, and Chicago fertilizer supplier Howard Pratt - were found with indications that they had died of carbon monoxide poisoning, according to press reports at the time. The sources close to the Robertson County grand jury said that Estes refused to answer questions about four deaths in West Texas, telling Dist. Atty. John Paschall that he wouldn't testify about anything "that would put me in the penitentiary." Paschall would not discuss the deaths Estes was asked about. Sources close to the grand jurors said they considered part of Estes' testimony to be truthful but believed he was shading his story to put himself in a better light.